Mirrored (Silvered) Glass is available from Fire Glass UK in a range of thicknesses (from 2 mm to 19mm) and in a range of sizes. Speak to us about your requirements – we are here to help. 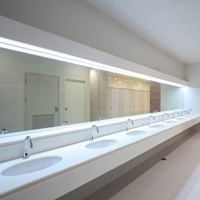 Mirrored Glass is also known as Silvered Glass – glass that has a metal reflective coating applied to one side (usually made of silver, aluminium, gold or chrome) sealed with a protective layer to prevent it from shattering into pieces if broken. 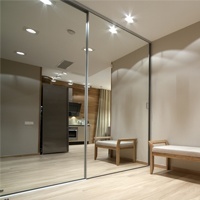 Mirrored glass has significant aesthetic and functional benefits from an architectural and design point of view. Colour and tinted options can offer a better degree of harmonisation with other building materials being used and can increase (or make the most of) natural light whilst also reducing glare that may become a problem with ordinary glass. 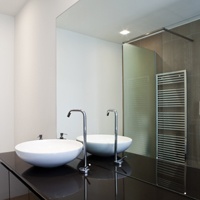 Mirrored Glass can be used to enhance views and open up small spaces. It is flexible and can be used within furniture or as wall panelling, as well as its more general use for framed or unframed mirrors.